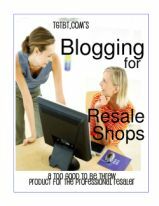 Were you looking for our TGtbT.com Professional Resalers blog, instead of how to create your own blog? AuntieKate.wordpress.com is here. A guide for retail stores, especially resale, consignment, and thrift shops. Do you have a blog? Maybe it's abandoned or you never really got it going. Maybe it’s a part of your social media tactics, but you dread having to blog. If you’ve ever thought about starting, or attempted to start, a blog for your bricks-&-mortar shop, we're here to help. Are you frustrated because it always seems like something on your web site is out of date? Your shop blog is ready to help. As I researched and organized information about the easiest ways to blog (since, after all, you are a shopkeeper, not a web master), I was constantly frustrated because much of the information on the web about blogs is directed towards online businesses... and what you want your shop blog to do, is to get people in your real, bricks-&-mortar store. So I decided I would gather the best information, create a treasury of links and how-to's about blogging especially addressed to the store owner or manager who wants an easy-to-use, easy-to-alter, and above all, quick way to publicize, personalize, and promote her or his resale shop in Blogging for Resale Shops. Get your copy now... it's a Pretty Darn Quick file we'll email to you! And you know what? It's easier to blog than it is to do social media! It's quicker, it can be automatically cross posted, and it remains accessible, so you can use blog posts over and over. And your prospective clients can scroll through all your posts at their leisure. Blogging for Resale Shops can take your whole social media campaign to a higher, more professional level.